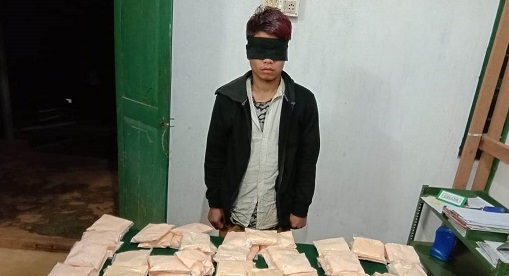 Tengnoupal Battalion of 26 Sector Assam Rifles have apprehended an alleged narcotics smuggler carrying 1.1 Kg brown sugar worth approximately Rs 2.2 crores in Manipur on Tuesday, officials informed in Wednesday. The miscreant was apprehended from Permanent Vehicle Check Post (PVCP) at Khudengthabi located about 90 km south of Imphal along indo-Myanmar road. “On February 5, based on specific input from a reliable sources, a team of Tengnoupal Batallion Assam Rifles stopped a silver colour Maruti Omini Van( MN 01 G 6522) travelling from Moreh to Imphal at PVCP, Khudengthabi,”stated PRO Assam Rifles (South) in a press release on Wednesday. “On carrying out a thorough check of the vehicle, orange coloured substance suspected to be brown sugar of approximately 1.1 kg were found hidden inside a fabricated compartment above the fuel tank in the chassis,” the release added. The apprehended person identified himself as one Lunkhomang Haokip(26) and a resident of Moldennom Village in Chakpikarong sub division of Chandel district,it further stated. The recovered items along with the arrested miscreant were handed over to the Narcotics Control Bureau in Imphal. Meanwhile, Moreh Battalion of 26 Sector Assam Rifles under the aegis of Inspector General of Assam Rifles (South) has initiated a mega de-addiction drive at Moreh town from Tuesday last. As an initial step a free medical camp was at de-addiction center Moriah Lhangtheng, Ward No 2, Moreh, Tengnoupal District, Manipur by Medical officer and staff of Unit hospital, the release added. A total of 53 patients (42 males, nine females and two children) attended the medical camp and were educated on the benefits of a drug free life and the critical withdrawal symptoms associated with deadiction.